Ignore the nameplate: Triumph hasn’t unleashed a motorcycle that is, quite literally, the master of speed. Nope, it has instead created a machine that manages to blend some of the punchy engine attitude flaunted by the recent Bobber series with a laid-back demeanour typically associated with more traditional Bonnevilles. It’s not particularly quick, nor is it massively different from the Bobber with which most of its oily parts are shared, but Triumph has somehow managed to create yet another bike that boasts its own very distinctive character. 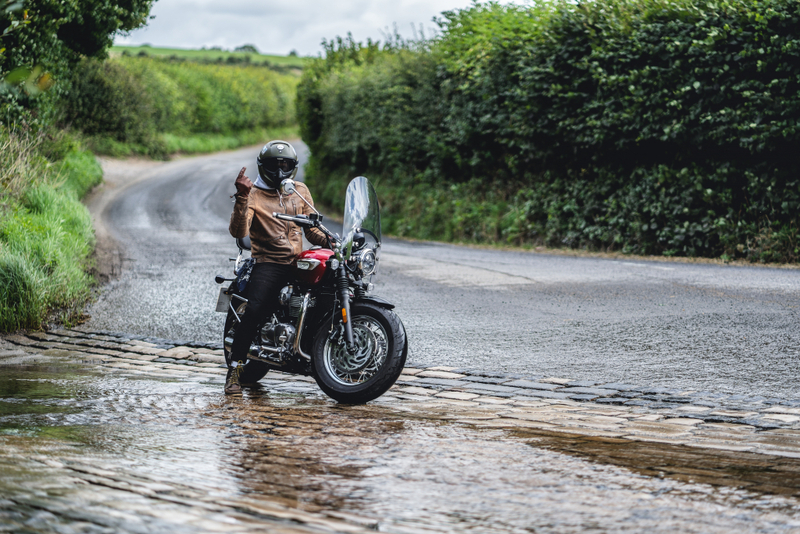 It’s safe to say we loved the mean, aggressive and in-yer-face attitude of the Bobber and Bobber Black, but after thrashing the latter around the Ronda Road (and freezing our buns off), we spent more time getting to know it on UK roads. 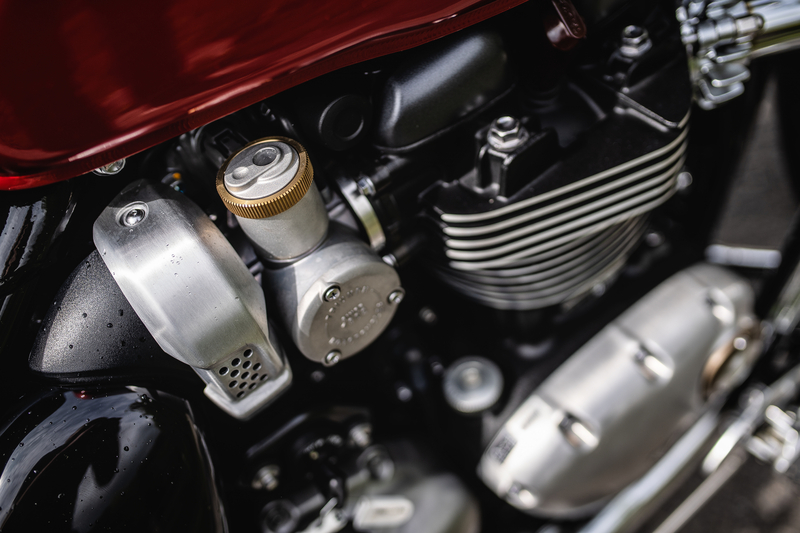 Still impressed with its styling and grunty 1200cc engine, we found that it was some of the aesthetical extras that began to wear thin after using it daily back in Blighty. The seat didn’t offer much support for the backside, the tank – at nine litres – proved too small for longer motorway hacks and the seating position proved a little uncomfortable for anything more than a blat into town or local cruise. 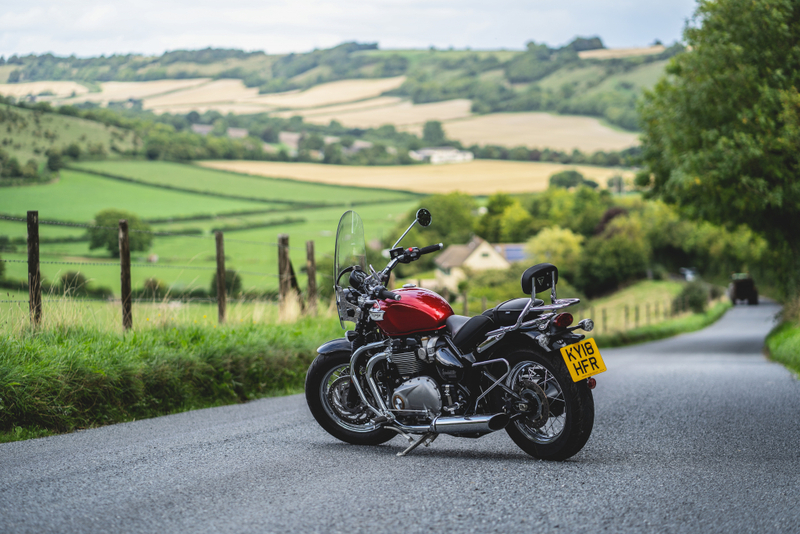 These were all things we were willing to forgive for the sheer joy of owning such a head-turning machine, but Triumph isn’t one to rest on its laurels and has addressed most of these issues. 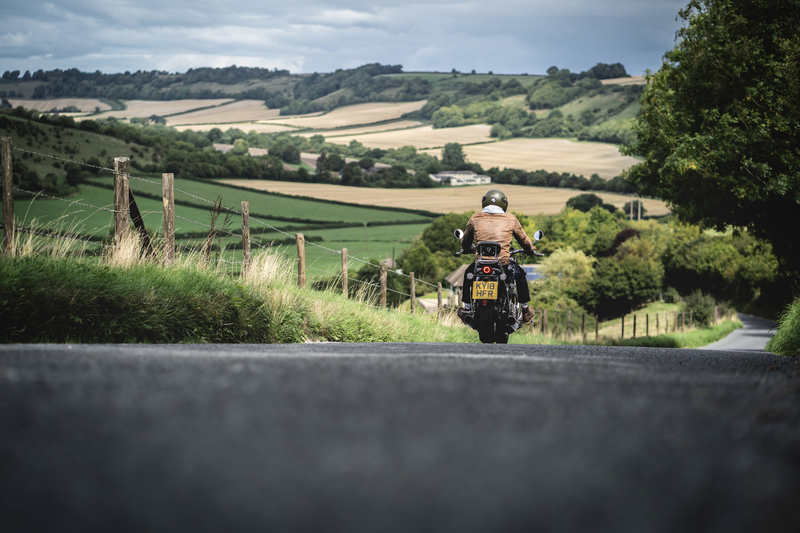 The result is the Speedmaster: essentially a Bobber with some of the attitude beaten out of it. 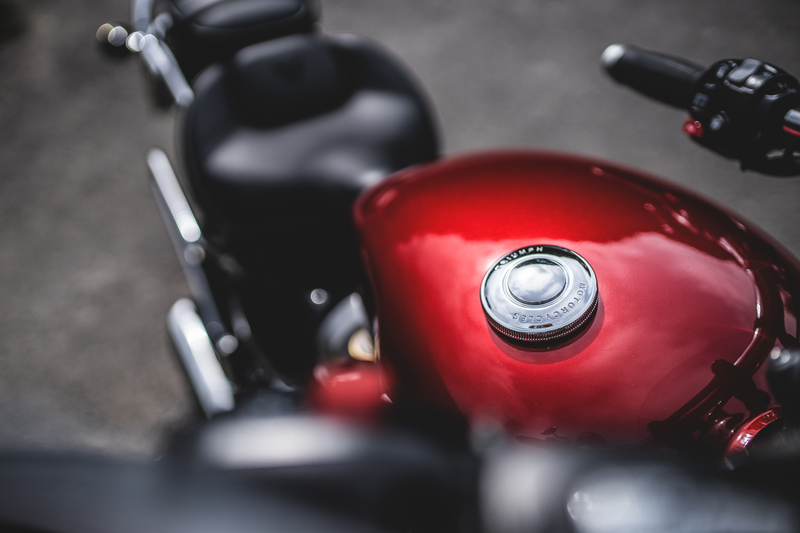 You get the same 1200cc parallel twin engine as the Bobber, but there is the addition of an uprated front brake to make sure it stops just as well as it goes. 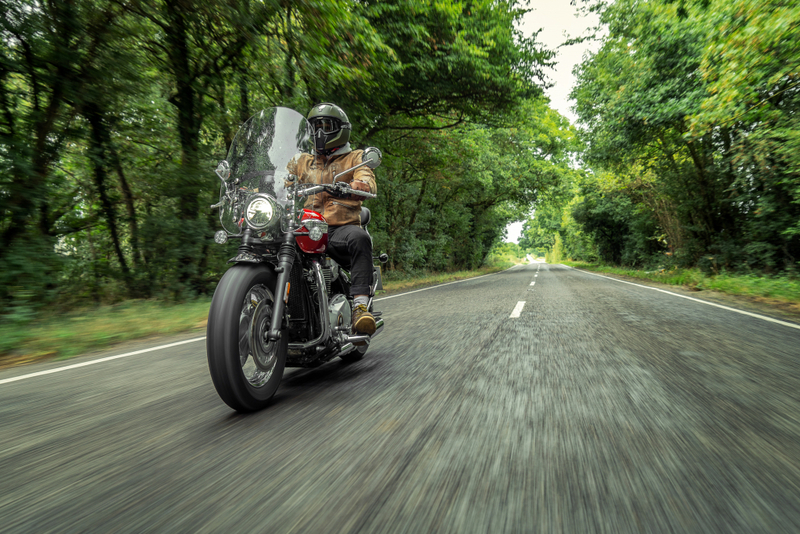 There’s beefed-up suspension, which includes a mono-shock rear unit hidden under the rider’s seat, to cope with the weight of a pillion passenger, who can comfortably sit on the rear pew and grab the provided handles for support, while cruise control comes as standard. Throw a leg over the Speedmaster and there’s a gratifying feeling of ‘oneness’ with the bike, thanks in part to a low seat height and swept-back bars that give an instant sense of comfort and connection. Even the forward-set foot pegs aren’t particularly daunting (unlike those found on some Harley-Davidsons) and actually make for a relatively comfortable ride once up to speed. However, we did experience little discomfort in the lower back on longer rides and the swept-back bars mean that a fair amount of weight is placed on the wrists, but this can be dealt with via a few position changes. As with other Triumphs running this 1200cc engine, we found the throttle delivery a little lumpy at low speeds, often requiring a bit of clever clutch work to get through traffic comfortably, but it’s otherwise smooth on the open road. 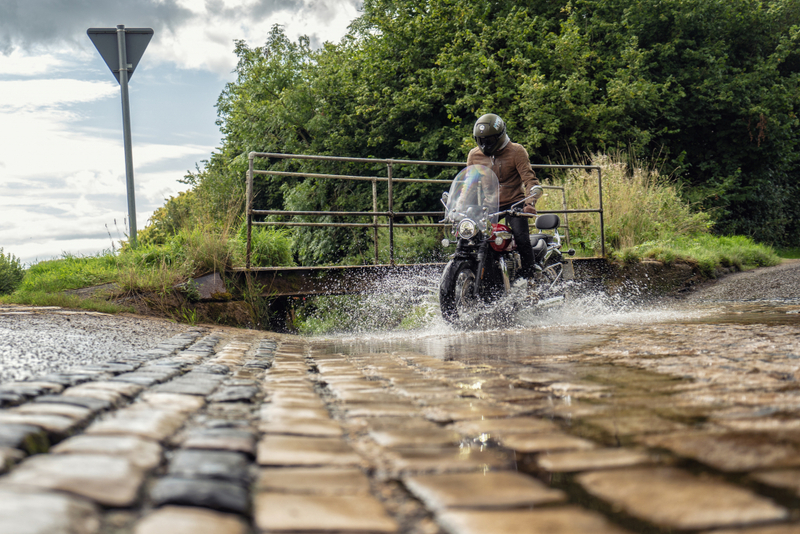 Get it on your favoured section of tarmac and it’s surprisingly nimble, tucking into corners with ease and only relenting when the forward-set footpegs inevitably scrape along the ground. Triumphs combination of impressive chassis and clever suspension set-up has paid dividends again here. It’s most definitely a cruiser at heart but customers will be shocked to find it corners far better than rivals when pushed. The press bike that was delivered arrived sporting it’s eye-catching Cranberry Red paint job and unique chrome pipes, which sound great when the engine is fired up and lazily idling. 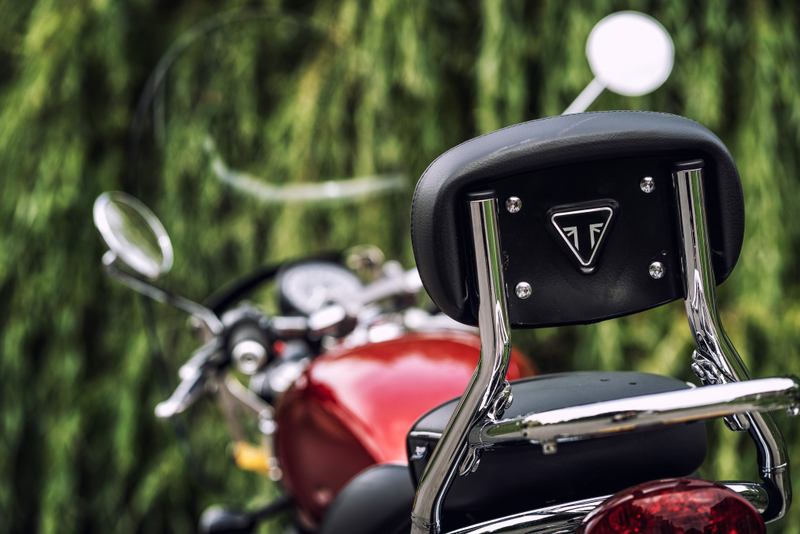 Curiously, someone at Triumph HQ also decided to fit a plastic front screen that looked as if it had been punched off an OAP’s mobility scooter. Not only did this big slab of coated polycarbonate look a bit naff, it also did the grand sum of bugger all to aerodynamically force oncoming wind up and over the rider’s head. 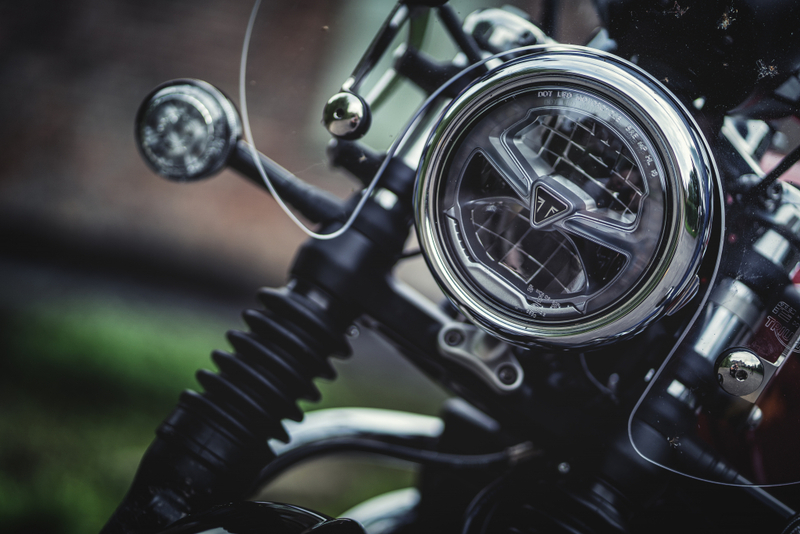 Unless you assume an uncomfortable tucked position behind the screen, it only serves to force wind and weather on to the top of the helmet, which results in a fair amount of buffeting at higher speeds. Thankfully, this is a £360 factory fitted option that’s extremely easy to remove (and ignore on the options list entirely), but that’s not to say you shouldn’t spend a few hours perusing the accessories on the Triumph website. 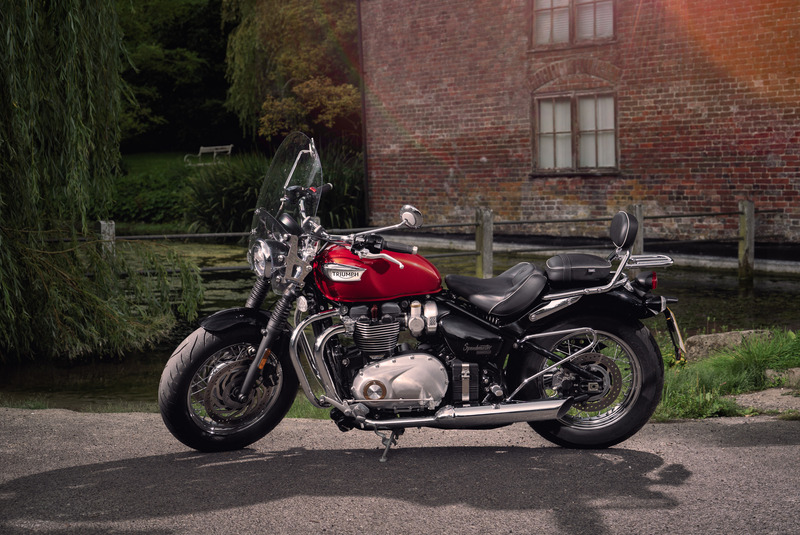 Waxed cotton panniers, chrome mirrors, black rims, footboards and quilted leather seats can all drastically alter the look and demeanour of your Speedmaster but it’ll also punish your wallet. Minus the front screen, we like the look and stance of the bike. It’s low, non-threatening and easy to get comfortable on but look a little closer and there are a few little details that stand it apart from the rest of the range. The British bike manufacturer runs the risk of becoming a bit of a one-trick pony with its Modern Classics range but the truth is, its array of 1200cc machines each features a distinct character of its own. 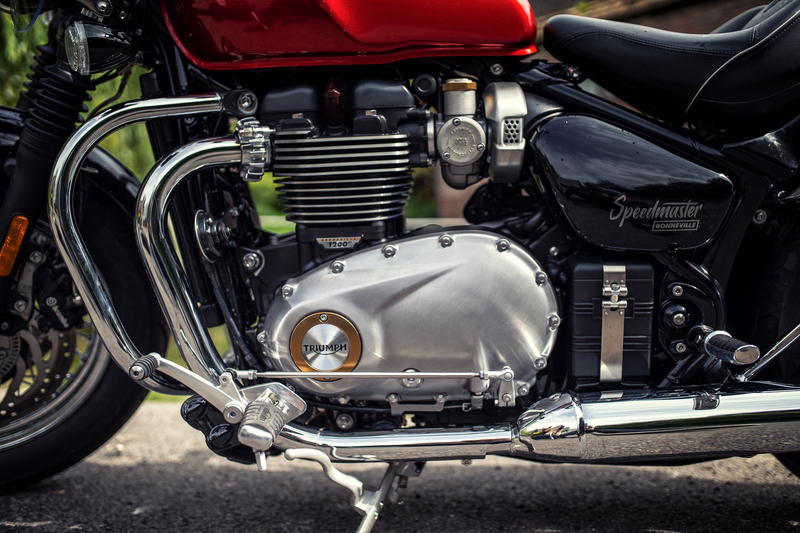 This risk is no more apparent than with the Speedmaster, which share a multitude of parts with its Bobber brethren, but somehow manages to impress with its own laid-back personality. 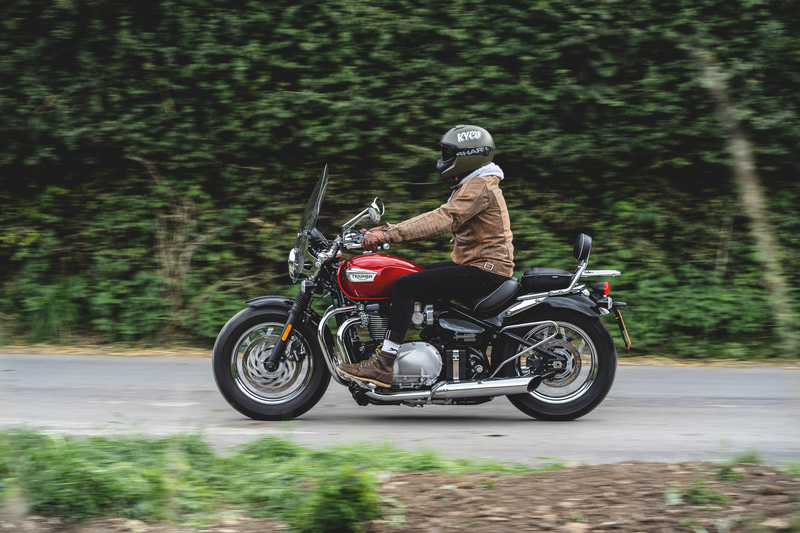 In short, if you can’t quite put up with the sacrifices in comfort demanded by the ultra-cool Bobber, the Speedmaster is probably the bike for you. Although it will likely still feel slightly rough compared to the marque’s Thunderbird and rival modern cruisers. The retro styling, bespoke styling touches, nimble handling and punchy engine make it a great bike to live with everyday but perhaps the most disappointing element of our test ride was the discomfort felt on the longest and dullest motorway hacks. This is possibly remedied with an upgraded seat or a fiddle with the riding position but that’s only going to add to the already hefty £11,650 asking price. Leon wears Furygan Coburn Jacket (£399.99), Shark Vancore Helmet (£249.99) and Resurgence Skinny Fit Cafe Racer Jeans (£219).